Our visit to the Gulf Coast for the Thanksgiving holiday weekend included a drive between Orange Beach, AL and Panama City Beach, FL. 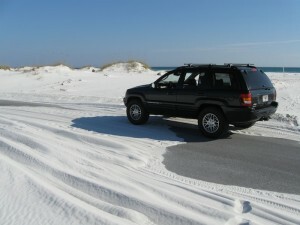 The plan was to drive the beach roads with a stop at historic Fort Pickens in the Gulf Shores National Seashore. While the trip to Fort Pickens and the tour of the fort was interesting, the highlight was the 100 mile slow drive along the seashore to Panama City Beach. Fort Pickens is a Civil War-era fort that was equipped with shore batteries to protect the entrance to Pensacola Bay. While only a few original guns remain, the walls and defenses still stand, and afforded us a few hours of exploration. While average speeds were about 35 mph, this portion of Fort Pickens Road was posted somewhat slower. Leaving Fort Pickens, we retraced our route in along Fort Pickens Road toward the entrance of the park. Along the way we checked out some public beach access areas, many of which were partly covered with the fine grain sand blown in off the beach. The road was rebuilt several years ago, and designed to withstand the repeated floodings that occur on the island. At the far west end of the island, the Fort and it’s adjacent buildings are often cut off by the water. 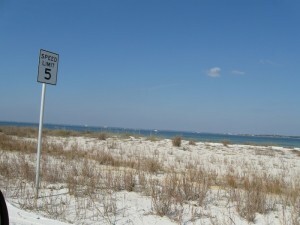 The run from the fort to Pensacola Beach, which is just outside the park entrance is 9 miles. Traveling past the hotels, restaurants, and attractions of Pensacola Beach takes only moments, then continuing east on Gulf Boulevard provides for an 18-mile ride the remaining length of Santa Rosa Island. 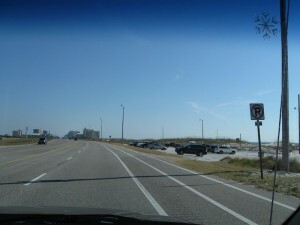 Gulf Blvd is a two lane road along the beach, with a speed limit of 35 mph. It travels past sand dunes, public beach access points, and wide expanses used by hikers and as landing strips for paragliders. While there are a limited number of places to stop and park, the slow speed limit sets a laid-back pace allows a lot to be taken in. 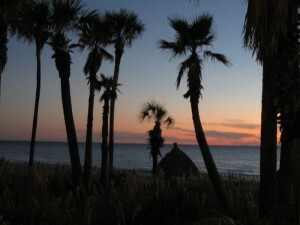 There were numerous places along the way to stop and access the beach. For the most part, the highway consisted of stretches of beachfront open road with occasional clusters of highrise condos and hotels. On this particular day, a steady breeze was blowing off the water, and combined with the 70-ish temperatures and clear skies, dropping all four windows and the sunroof made for a perfect drive. At the eastern end of the island is Navarre Beach, and there is a pier here for those who want to walk and take a break. Gulf Blvd turns north from here and crosses the Intercoastal, where it took us into Navarre. We stopped for some lunch and then headed east on US 98 toward Destin. We passed through Fort Walton Beach and past Eglin AFB before getting into Destin in mid afternoon. Continuing east on US 98 took us through the beach towns of Miramar Beach, Hollywood Beach, and Laguna Beach, where it is combined with Route 30A – the topic of the many 30A vehicle window stickers all over the southeast. We finally pulled into Panama City Beach a bit late to catch the sunset, but there were many places along the way we could have stopped to take it in.